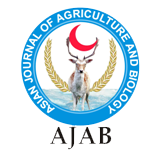 Asian Journal of Agriculture and Biology (AJAB) is a peer reviewed, open access, quarterly journal serving as a means for scientific information exchange in international and national fora. The scope encompasses all disciplines of agriculture and biology including animal, plant and environmental sciences. All manuscripts are evaluated for their scientific content and significance by the Editor-in-Chief &/or Managing Editor and at least two independent reviewers. All submitted manuscripts should contain unpublished original research which should not be under consideration for publication elsewhere. In order to avoid unnecessary delay in publication, authors are requested to comply the following guidelines; differing these, your submission will be returned for additional revision. Please note that articles published in AJAB are open access articles published under Creative Commons CC BY 3.0 License (https://creativecommons.org/licenses/by/3.0/). This license permits use, distribution and reproduction in any medium, provided the original work is properly cited. Articles are comprehensive accounts of significant experimental or theoretical results, authors are asked to write their manuscripts in a clear and concise manner and to include only data crucial to arriving at their final conclusions. Communications are preliminary reports limited to approximately 1,500 words (including tables, figures and references). They must be of sufficient importance and general interest to justify accelerated publication. Reviews and mini-reviews are by invitation only. Authors interested in preparing a review article should provide a brief outline to the Managing Editor requesting an invitation to submit a manuscript. All manuscripts should be in English, written in Times New Roman font with default MS Word settings. Article should not exceed 15 pages, excluding tables, references and 1-4 figures. There should be no more than 45 refer­ences in an original article (no more than 100 in a review article). Brief reports contain less scientific data than the original articles and should not have more than one figure and/or table. Submit your text in MS Word format. Figures &/or tables should be placed at proper place in the same document. Separate files figures &/or tables will not be considered/entertained. Include all authors' names below the title. Footnote numbers are placed outside commas in multi-authored articles. The transmittal letter should designate one corresponding author indicated by a superscript *(e.g., Iqbal*). Also give his/her complete address for postal and e-mail purpose. An abstract should be concise (100-250 words) self-contained summary, should include the background/ objective, purpose of the study (including its statistical significance), methods, results and conclusion in one paragraph. Abstract should be continuous, without any heading/subsection. For indexing purposes each submitted article should include three to five key words. In addition to facilitating indexing of articles, our keyword system assists in the assignment of qualified reviewers for your manuscript. Standard abbreviations should be used without periods throughout the manuscript. All non standard abbreviations should be kept to a minimum and must be defined in the text following their first use. The experimental procedures should be described in sufficient detail to enable others to repeat the experiments. Names of products and manufacturers should be included only if alternate sources are deemed unsatisfactory. Novel experimental procedures should be described in detail, but published procedures should merely be referred to by literature citation of both the original and any published modifications. The purity of key compounds and descriptions(s) of the method(s) used to determine purity should be included in this section. Manuscripts containing data generated from animal and/or human studies must specify the committee and the institution that approved the experimental protocols used to generate these data. Concise tables and figures should be designed to maximize the presentation and comprehension of the experimental data. The same data should not be presented in more than one figure or in both a figure and a table. As a rule, interpretation of the results should be reserved for the discussion section of an article, but under some circumstances it may be desirable to combine results and discussion in a single section. The purpose of the discussion is to interpret the results and to relate them to existing knowledge in the field in as clear and brief a fashion as possible. Information given elsewhere in the manuscript should not be repeated in the discussion. Extensive reviews of the literature should be avoided. Evans MA, 2012. Article title: subtitle (begin with lowercase after colon or dash unless first word is a proper noun). J. Abbr. 00:000–000. Evans MA, 2011a. Title. J. Abbr. 00: 000–000. Evans MA, 2011b. Title. J. Abbr. 00: 000–000. Evans MA and Burns R, 2012. Title. J. Abbr. 00: 000–000. Evans MA, Tyler A and Munro HH, 2010. Title. J. Abbr. 00: 000–000. Evans MA, 2012. Title. Asian J. Agri. Biolog. (in press). Burns R, 2011. Title: Subtitle. Publisher, City, State. Evans MA, 2011. Colorado potato beetle, 2nd ed. Publisher, City, State or Country. Tyler A, 2013. Western corn rootworm, vol. 2. Publisher, City, State or Country. Tyler A, 2011. Article or chapter title, pp. 000–000. In T.A.J. Royer and R. B. Burns (eds. ), Book title. Publisher, City, State or Country. Tyler A, Smith RST and Brown H, 2011. Onion thrips control, pp. 178–195. In R. S. Green and P. W. White (eds. ), Book title, vol. 13. Entomological Society of America, Lanham, MD. (USDA) United States Department of Agriculture, 2011. Title. USDA, Beltsville, MD. (IRRI) International Rice Research Institute, 2013. Title. IRRI, City, State or Country. Harred JF, Knight AR and McIntyre JS, inventors; Dow Chemical Company, assignee. 1972 Apr 4. Epoxidation process. U.S. patent 3,654,317. Martin PD, Kuhlman J and Moore S, 2011. Yield effects of European corn borer (Lepidoptera: Pyralidae) feeding, pp. 345–356. In Proceedings, 19th Illinois Cooperative Extension Service Spray School, 24–27 June 2011, Chicago, IL. Publisher, City, State. Rossignol PA, 2012. Parasite modification of mosquito probing behavior, pp. 25–28. In T. W. Scott and J. Grumstrup-Scott (eds. ), Proceedings, Symposium: the Role of Vector-Host Interactions in Disease Transmission. National Conference of the Entomological Society of America, 10 December 2012, Hollywood, FL. Miscellaneous Publication 68. Entomological Society of America, Lanham, MD. James H, 2010. Thesis or dissertation title. M.S. thesis or Ph.D. dissertation, University of Pennsylvania, Philadelphia. SAS Institute, 2011. PROC user's manual, version 6th ed. SAS Institute, Cary, NC. Reisen W, 2012. Title. Complete URL (protocol://host.name/path/file.name). This section should acknowledge financial support, technical assistance, advice from colleagues, gifts, etc. Permission must be received from persons whose contribution to the work is acknowledged in the manuscript. Tabulation of experimental results is encouraged when this leads to more effective presentation or to more economical use of space, tables should be numbered consecutively with arabic numerals with a brief title and a brief heading for each column. Clearly indicate the units of measure (preferably SI). Explanatory material referring to the whole table is to be included as a footnote to the title which should be given lower case letter designations and cited in the tables as italicized superscripts. Galley proof is sent to the corresponding author of the paper. Galley proof should be verified against the manuscript and appropriate corrections should be made within stipulated time. Substantial changes in a manuscript after typesetting require editorial approval and in some cases may be subject to re-reviewing of the said article. If errors of consequence are found in the published paper, correction should be sent by the author to the Editor-in-Chief. Authors are responsible for all statements made in their work and for the accuracy of the bibliographic information. The right is reserved to incorporate any change deemed necessary by the editorial board to make contributions harmonize with the editorial standards of the journal. The author will pay USD 150 as publication charges after the manuscript is reviewed by AJAB reviewers and found suitable for publication. There are no processing charges for submitted articles.